It’s important to make sure your energy supplier knows exactly how much gas your business is using every month, so you get charged the right amount for the gas you actually use. Ideally, you should give your supplier a reading at least every month, to make sure your bills are completely accurate. Although quarterly readings will also do, if you submit readings any less frequently, your supplier will use an estimate to calculate your bills, based upon the size and type of business you run. Your energy supplier might visit your business to take meter readings, but they’re only legally obliged to do this every two years. So, if you rely on this, you could easily find yourself paying too much or too little – either way, you could be left substantially out of pocket. If you get into debt with your supplier, you’ll have to pay back any money you owe before you can switch. This could mean you end up paying even more if you get stuck on an expensive rate. If you’ve been paying too much, then you’ll have the hassle of claiming the money back from your supplier. In either of these instances, you’ll need to get a new gas meter installed. If you’ve recently moved into your business premises, you might find that there isn’t a gas connection. This tends to be because you’re moving into a property that doesn't have a meter, or one that has a meter that was previously disconnected. If there is a meter installed, you might find that it’s taking inaccurate readings. In other instances, a business that hasn't needed gas in the past may decide that a supply could be useful, or even necessary, in widening its operations. 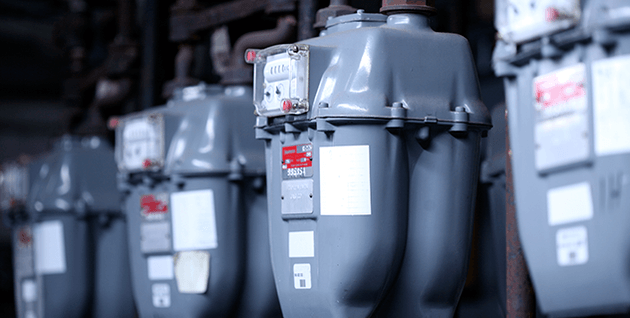 If your business premises has an existing gas supply and meter installed, you should contact the National Grid to check whether or not the meter has been disconnected. You should also ask the Grid if the existing meter is going to be capable of meeting your business's supply needs. It usually takes the National Grid around 15 working days to complete their checks. What types of business energy meters are available? There are lots of different types of business energy meters available to cater for different types of businesses. The type of meter you should go for depends on your business’s specific needs. Single rate meter: charges one flat rate for all the energy your business uses. Suited to business that run during peak hours, like retailers and high-street cafes. Multi-site meters: lets you consolidate your energy usage across several sites. Suited to large businesses that operate across multiple premises. Smart meter: typically charges a flat rate for all the energy your business uses, and automatically sends readings to your supplier. Suited to most types of businesses. Two rate meter (also known as Economy 7): charges a cheaper rate for off-peak hours and a more expensive rate for peak hours. Suited to business that run throughout the night, such as some manufacturers. Three rate meter: similar to a two rate meter, but also charges a third rate for weekends. Suited to business that run over weekends, like restaurants and pubs. Economy 10: charges two separate rates for off-peak hours and peak hours. Similar to Economy 7, except that the off-peak times can be split up over a 24 hour period, and don’t have to run in succession. Suited to businesses that have specific requirements when it comes to operating times. Half hourly meter: typically charges a flat rate for all the energy your business uses, and automatically sends readings to your supplier every 30 minutes. Suited to businesses that use a lot of energy and want more accurate billing with close to real-time usage data. To get a new business gas meter installed – or an old one reconnected – speak to one of our energy experts on 0800 326 5530. We'll search the market to find a fair deal for your business's gas and arrange the setup of your new meter.